Perception is everything, particularly when it comes to effectively pricing your product or service. The world’s most successful companies and brands understand the psychology of pricing, they share an innate awareness that how their customers perceive a price is as important as the price itself. After all, price is not just a series of numbers- it is our perceived value of the product or service. This means that our perception of price is influenced by its context. 1 This is why creating a compelling narrative around your product is critical. Mastering the art of pricing strategy has its fair share of challenges and complexities, which is why it’s more important than ever before to understand the specifics behind the psychology of pricing. 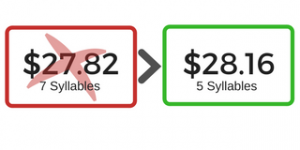 By understanding psychological pricing as well as consumer behavior and appropriately applying it to your pricing strategy, you’re able to deftly guide your customers’ perceptions of prices, making them more likely to buy. Here, context is key and the manner in which certain prices are presented to consumers have a bigger psychological impact than others. 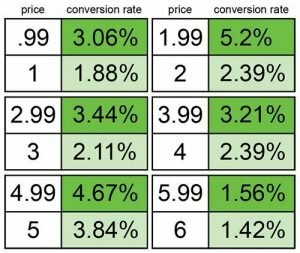 Below you’ll find nine pricing tactics that aid in providing your customers with that all-important context. By adopting these specific techniques you’ll be able to capture their attention and appeal to the psychology of buying that helps them determine the perceived value of what you’re offering. 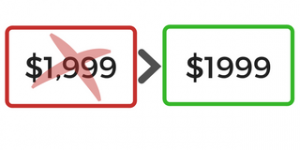 You’re likely aware of the magic effect of ending a price with 99 or 95- it’s arguably one of the most commonly used pricing tactics. What you might not know is that dropping the left digit makes an even bigger difference in a buyer’s price perception. Why? It’s quite simple- we read numbers from left to right. This means that the left digit is what our brain encounters and processes first, essentially shaping our perception of the price. A word of caution, the charm of nine-ending prices does not come without its own set of nuances. Research proves that prices ending in 99 positions your product as a bargain. This is great if that’s how you want your product or service to be positioned, less so if you’re positioned as a luxury purveyor or selling high-end or big-ticket items. 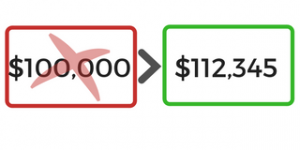 The nine-ending pricing tactic elicits a price-conscious response in the buyer. This can be problematic in the instance of luxury goods and services. For these customers, the perception of a bargain may imply a reduced value associated with the product. Nordstrom, positioned as a mid to upper market retailer, never uses prices that end with 99 under the Nordstrom brand. However, everything is priced .99 at Nordstrom Rack, the outlet store to enhance bargain shoppers perceived value. Although it might appear irrelevant, the syllabic length of your price alters how the price is perceived. Say what? Simply put, the more syllables a price contains, the more mental resources are needed to decode the price. Our brains are wired to look for the easiest and quickest way to get to a result. The more effort needed in deciphering a price, the higher we perceive it to be. Take the above example and actually sound it out. Go on, you’ll immediately notice the difference. Our brain applies universal conceptualization of size, something visually larger appears to have a larger value. 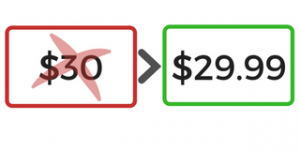 That’s why customers perceive your price to be lower if you display your price in a smaller font size and why visually bigger prices appear higher. 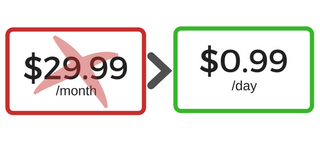 Take this into consideration when designing how your price will be displayed. Position larger elements around the actual price as these will reinforce a smaller visual size and a smaller price by contrast. Conversely, discounts follow the opposite pattern. Since you want to maximize the impact of the discount, you should display those numerals in a large font size. Since syllabic length affects our perception, removing the comma will reduce the length of your price. Fewer syllables make it easier for your brain to process the price. It should be a no-brainer that the language you use in relation to your price has a dramatic impact on its perceived value. When you choose the language that you want to appear near your price, choose words that are congruent with a small magnitude. Use words such as “low”, “small”, “mini”, “tiny”, etc. Your customers will have a favorable response to the association that these “small” words have in relation to the price. There’s little doubt that the biggest marketplace for goods and services can be found online. 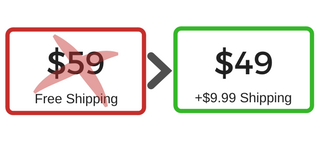 If you sell products online you should ideally separate shipping and handling fees from the actual cost of the item. One such technique is called partitioned pricing, where the price is separated into multiple components. Here, you anchor buyers on the base price rather than the total cost of getting the product in hand. When buyers compare your price to a reference price, they’ll be more likely to pull your base price into the comparison. A research study tested this theory using eBay auctions. They set up auctions for music CDs, and they analyzed different bidding structures. Some auctions offered a low opening bid WITH a shipping cost (e.g., $0.01 with $3.99 shipping). Some auctions offered a higher opening bid WITHOUT a shipping cost (e.g., $4 with free shipping). The result was that auctions with low opening bids (plus shipping charges) attracted more bidders and generated more revenue. 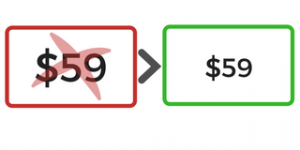 By offering your customers the option to pay for your product or service in smaller increments instead of a large once-off sum, you’re more likely to anchor them to a lower price. In the realm of consumer behavior, one of the most common cognitive biases you’ll find is anchoring. This refers to people’s tendency to heavily rely on the first piece of information that is presented to them when making decisions. Let’s say you’re selling an online course for $599. By offering your customers the option of paying in installments (e.g. 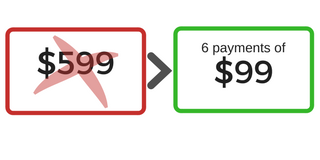 six payments of $99), you affect their comparison process. They’ll be more likely to recall and retain your installment price of $99 and compare it to a competitor’s lump sum (e.g. $600) – a difference that makes your offer appear more appealing. Let’s get one thing straight. People aren’t stupid and they know that comparing a $99 installment to a $600 lump sum isn’t accurate. The point is certainly not to misdirect your customers in terms of the actual cost. The fact of the matter is that people often compare reference prices subconsciously. This means that your installment price has a good chance of sneaking into their comparison. Another technique you can adopt is to reframe your price into its daily equivalence e.g. $0.87/day. Much in the same way buyers are more inclined to latch on to an installment price, breaking up the price into smaller pieces (in this case a daily equivalence) results in the perception of a lower overall price. Again, the purpose is not to mislead your customers. Your regular price should remain your primary focus, simply mention the daily equivalence. That low number provides the context needed to anchor the buyer toward the lower end of the price spectrum. Having trouble reframing your price into a daily cost? No worries. You can achieve the same effect by comparing your price to a petty cash expense, such as a cup of coffee. One research study analyzed 27,000 real estate transactions and concluded that buyers pay more when prices are specific rather than rounded. Researchers concluded that precise prices are actually perceived to be lower than neatly rounded prices, due to our habit of seeing precise numbers when dealing with low prices. We inhabit a world where competition on pricing has never been fiercer or more intense, making consumer perception that much more critical for long-term success. 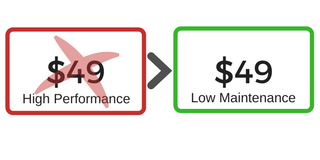 The pricing tactics above aren’t designed to fool your customers or seduce them into buying something they don’t want. They are strategic tools that have the power to capture your customers’ attention. They draw heavily on the human element that runs at the heart of any buying process, appealing to the psychology of buying that can help your customer determine their perceived value of what you’re offering. Remember that context along with perception goes a long way toward justifying whether or not a price is valid in your customers’ eyes. ← Houston you have a targeting problem. I think other website proprietors should take this website as a model, very clean and fantastic user-friendly style and design, as well as the content. You are an expert in this topic!